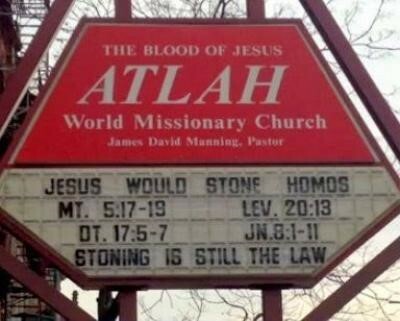 Stoning is still the law? After doing a bit of research on the web with readily available information resources on Wikipedia, the pastor’s own website, and other biblical websites. It seems the pastor has quite a colorful, albeit criminal background, one which he is more than willing to boast of and share with others. Tell me pastor, are you proud that you did those things or are you prouder that you’ve found people gullible enough to accept your notion that antisocial behavior as religiously sanctioned? You see, not everyone who looks at that “doctorate” degree you awarded yourself may be aware that the very act of snubbing societal norms, that of receiving a real accredited degree, is still a form of anti-social behavior. Sure you can do it, just like so many websites out their boasts – give them some money and you can be practically anything you wish. In thought, maybe, but as any actual legitimate form of sheepskin that so many legitimate PhD holders have worked so hard to get, no. Yeah, I got to thinking about it and when I did, it occurred to me, you’ve just found a whole new way of legitimizing your all too antisocial background. Now, instead of breaking the law directly, Jesus is there to help you do it through some not so carefully chosen bible verses. That you lay claim to condoning one of the most outlandish antisocial behaviors ever – killing another person, is utterly reprehensible. You see, killing someone in America is severely frowned upon, no matter what religion you claim to belong to. It kind of struck me odd that you included the one verse in the bible where Jesus actually stops a mob from stoning a woman for supposed adultery. And yet, you persist in laying claim that he would do the very thing he prevented. Never did Jesus ever take part in or condone such actions – EVER! Even further, you underscore your antisocial claim by saying, “Stoning is still the law.’ Pastor, in America, the land where you live and breathe – it is NOT the law. That you have chosen once again to snub societal norms in favor of the way you see it, is still antisocial no matter how you cut it. It’s still all-the-more antisocial and inexcusable to incite others to do that very thing by announcing it on your church’s placard. Shame on you James David Manning for even thinking to perpetuate such an appalling act. Then again, shame IS a social norm. Homosexuality may not be a “Christian” value, but hate speech for causing harm to another is even more so not a “Christian” value1. You have heard that it was said, An eye for an eye, and a tooth for a tooth. But I say to you, Do not resist the evil man [who injures you]; but if anyone strikes you on the right jaw or cheek, turn to him the other one too. And if anyone wants to sue you and take your undershirt (tunic), let him have your coat also. Possibly he thinks Fred Phelp’s role is vacant.